Blood Donation is a voluntary and altruistic act that saves lives. • Blood donation is safe, and all the equipment, blood bags and needles are disposable. • Blood donation ISN`T A WAY TO BE TESTED FOR AIDS OR OTHER INFECTIOUS DISEASES. • You should be aware of the WINDOW PERIOD. This is the time between the first infection and the time in which the tests designed to detect a specific disease can reliably detect that infection. So during this time an infected person cannot be detected as infected, and he may still be able to infect others. If you think you may be at risk for HIV/AIDS or want an HIV/AIDS test, please ask for information about other testing facilities. PLEASE DON`T DONATE BLOOD TO GET HIV TEST! You´re between 16 and 68 years old. • Don´t forget your official ID with a photo. • Besides these requirements, when you arrive at HEMORIO, you will have a private consultation and a brief medical history will be taken, including a check of your pulse, blood pressure and temperature, and a drop of blood is analyzed for hemoglobin content. Whole Blood Donation - Most HEMORIO donors donate whole blood approximately 450 ml. Men can donate every 2 months, 4 times a year. 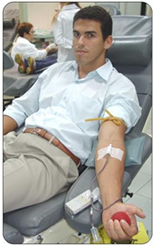 Apheresis – is a type of donation which uses an automated technology to collect just the blood component needed. Platelet donation - uses automated technology to collect a concentrated volume of platelets. In this type, donors give just platelets while red blood cells and plasma return to them. Platelets are necessary for clotting and are needed by cancer patients, accident victims and others with blood clotting problems. Double Red Cell donation – donors who meet minimum requirements can donate double red cells. In this type, donors give just red blood cells while platelets and plasma return to them. Donate your own blood to be used for your upcoming surgery. And if you have any questions about blood donation, your donor eligibility, and where you can donate blood, please call: DIAL -BLOOD - 0800-282 0708. Your complete honesty is very important for the safety of patients who receive your blood.